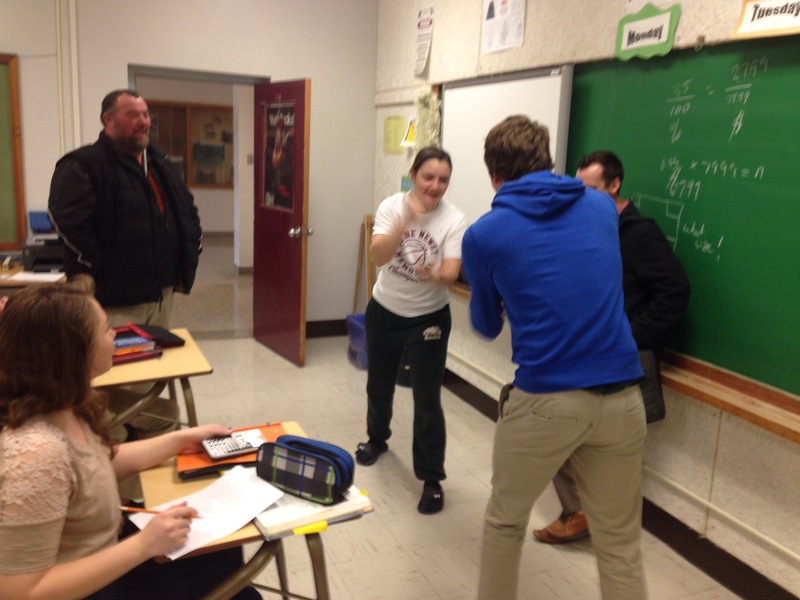 Here’s how I taught students how to solve trigonometric equations in our grade 12 advanced functions class. What has been working well is starting our “math” at a very low level…..like on a dial…..then we slowly turn the dial up….adding more “math” in. Read more about the Math Dial from a comment on Dan Meyer’s blog here. Starting with this video the math on the “math dial” is very low. I asked: What questions do you have after seeing this…. How fast is it spinning? Where will the red dot be after 3 min? And that last one is the question we studied. Almost all kids solved this problem using proportions! They kept the dial in the low position still! They realized that it takes 5 seconds to travel from dot to dot. Therefore it takes 40 seconds to go all the way around. They divide 3 minutes up into 40 second sections and get 4.5 rotations. The dot will end at the top of the Wheel!! But the Trigonometry in me was screaming to get out……I asked, “Did anyone create a trig equation to model the height?” — cue crickets! So we cranked the math dial up a tad! When I go on a ferris wheel I always look for my house.” We talked about how high that might be in relation to Dan’s problem….we settled on about maybe 40 feet. My question: How long will it take to get to that height? Guesses? Will it be a nice number? No? Why not? Let’s create an equation for the height in terms of time (we had already learned how to do this and it was no problem for the class) . Now, to solve our question we have to solve this equation! Student: That looks super hard! Me: It does doesn’t it! We don’t want the math dial going up too quickly! We do it! And everyone is into it….they have been waiting two days to see the answer! And the dial is pretty far up there! That was my highlight of the day! Best compliment for a teacher! We then show the graphical solution in Desmos. Oh…..and we started class playing Pictionary (It’s our Wednesday thing) there was a tie and we have a good o’l match of Rock, Paper, Scissors to declare the winner. It was Intense!!! I think it is easy for teachers to fall into the illusion that lowering the bar (or turning the dial down) can’t be done due to time. However, I think so much time can be saved avoiding the damage control necessary when student anxiety mounts after tossing out complex concepts too soon. It’s true, it appears that dialing it down takes more time. But in this case it took the same amount of time as if we taught in the traditional way (2 days). Instead we started with the goal and worked toward it. And you are quite right….we saved the time for the frustrations! The student that said “that was awesome” is a great kid but sometimes gets frustrated easily. Sounds like you really helped make it “click” for him/her through an approach that felt natural, rather than a set of procedures that had to be memorized before the knowledge could be unpacked. I think we can get to this place over time with all math lessons through thoughtful reflection and a ton of hard work. Thanks for taking on some of that work for the rest of us.